It’s hard being a Kentuckian sometimes. For many folks outside of the Bluegrass State, we are just a bunch of hillbillies. But I’ll gladly adopt the moniker as my own if that gives me access to Appalachian meals like the ones served at Hillbilly Tea. I drive by the restaurant about twice a week and could have sworn it was an abandoned storefront. Hillbilly Tea is located on First Street between Main and Market streets in the shadow of a White Castle at the corner. The restaurant’s name is printed in a bare-bones serif font on the window, and that’s all there is to outward displays. Come stay awhile, the chair says. When I met a couple of friends (and future roommates) at Hillbilly Tea for lunch, my mind was set on scoring a cold glass of one of the restaurants six iced teas ($1.95). 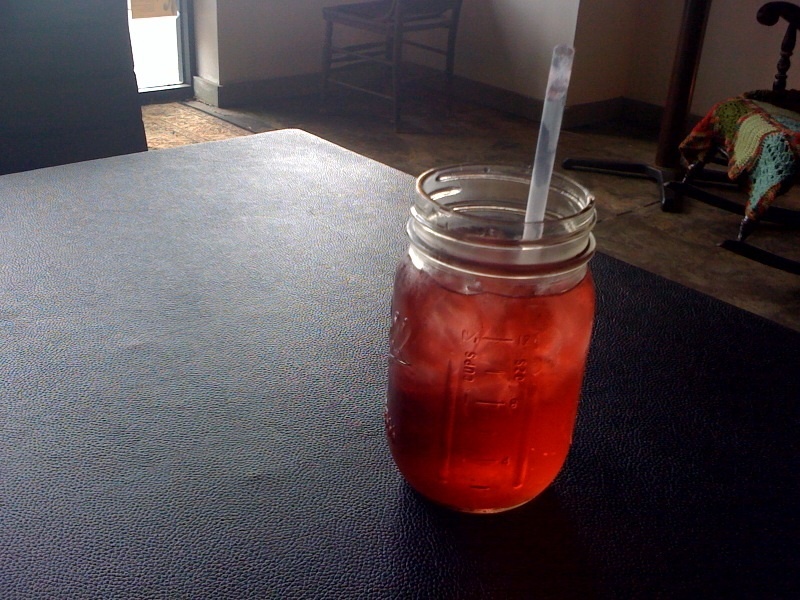 After we placed our orders at the counter and grabbed a booth, I promptly received a Mason jar full of red bush iced tea. Nothing spells relief like a sweaty Mason jar full of that cold concoction. The drink had a sweet cherry flavor that converted this iced-tea hater into a red-bush fiend. A jar of summer relief. The restaurant’s tea selection extends far beyond the beverage I had. Hillbilly Tea advertises itself as a tea cafe with food, and has 16 hot, whole leaf, organic, fair trade tea selections to prove it. Prices range from $3.25 for black tea to $4.25 for rare tea. And the teas are aptly named — some flavors include Awesome, Gunpowder, Twig and High Mountain. My favorite tea, chai, is in the rare tea price bracket, which would eat up nearly half of a $10 Challenge budget. It’s been awhile since I’ve been to the Appalachian parts of the state, but I’m pretty sure the food menu offers up an accurate representation of the region’s delicacies. The menu is divided into sections based on the foods’ origin: From the Kettle (soups), From the Creek (fish), From the Field (salads) and From the Pit (barbeque and smoked dishes). Some of the menu items sound like they were plucked from a rural grandmother’s stove, such as the crawdad and shrimp chowder ($5), fried frog legs with wild onion dip ($5) and moonshine pork ($7). I was ashamed that I didn’t know what some of the side dishes were, even though I am a born and raised Kentuckian — what is corn pone ($2) and apple chow-chow ($2)? I’ve learned that ordering the special is usually a good deal, so I went with that day’s Billybox Special — smokey chicken, veggie crisp with onion marmalade and chilled melon soup ($8). The melon soup was my first venture into cold soup, and it was a success. If summer had a taste, it would be that soup, which was served in a teacup. It was a fresh, crisp and cool way to cleanse the palate before tackling the heavier fare of the rest of the Billybox that literally came in a wooden box. 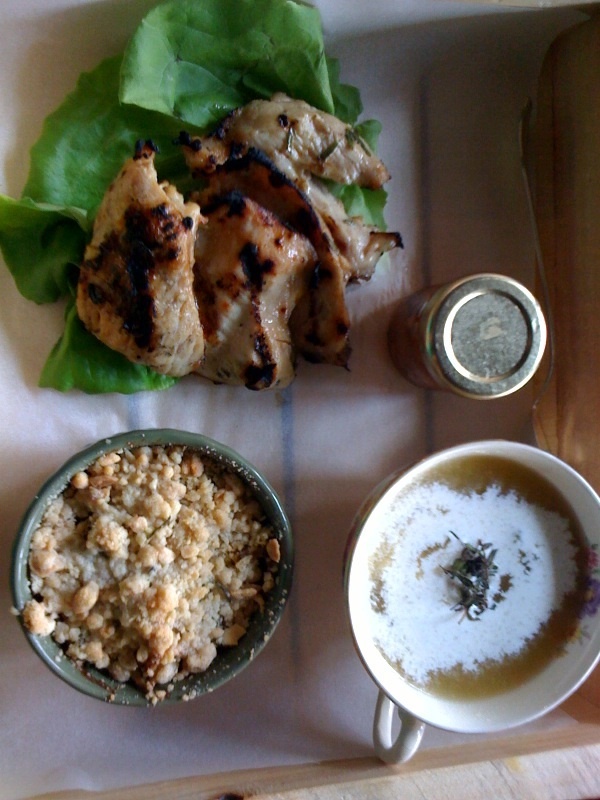 The smokey chicken was tender and coated with just enough charring to evoke the feeling of chowing down at a backyard barbecue. It was especially tasty topped with the onion marmalade that was served in a tiny glass jar (who doesn’t love food served in one of those things?). The marmalade was densely packed with long slivers of tender sweet onions. My favorite part of the meal was the veggie crisp. The employee at the counter wasn’t sure what was in the side dish, but said the customers loved it. I see why. The small dish was loaded with broccoli, green beans and bell peppers. The crisp was hot throughout, and a buttery, crunchy topping was evenly distributed throughout the dish. That topping makes eating vegetables so much more fun that ranch dressing. Before taxes, I came in 5 cents shy of my $10 limit, but ultimately had to put in an extra 55 cents. But I would be willing to put in a couple of quarters for the meal I had that day. 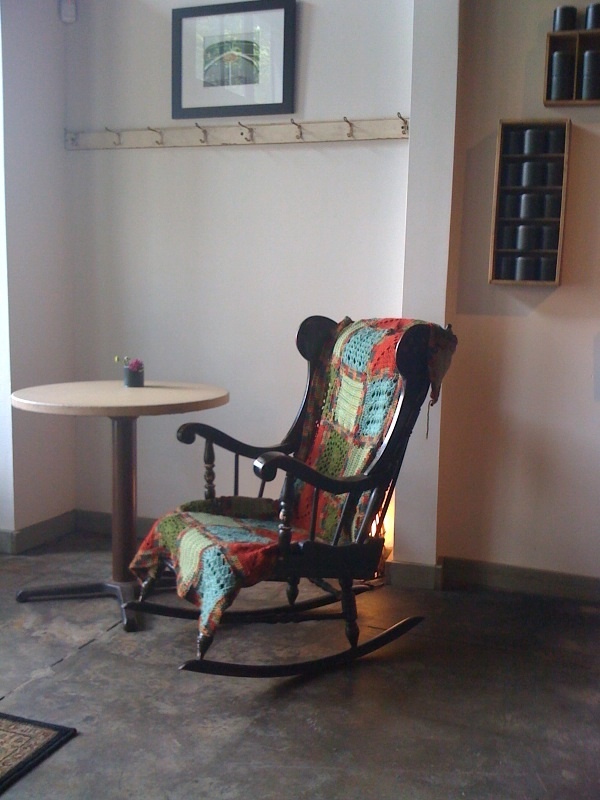 Hillbilly Tea, 120 South First Street, Louisville, Ky. This place looks fabulous and my friend Cindy and I are always looking for a great brunch/breakfast place in downtown L’ville. We have season tickets to the Actors Theatre Saturday matinees. So, thanks for the this suggestion. We will absolutely try this fabulous place! Oh, and P.S. We miss you!